If you use a tripod to take macro shots, then you’ll know that getting the exact spot to position your tripod is not always easy. Additionally if you are taking an image at high magnification then getting the focus sharp can also be a problem. A useful piece of equipment for both these scenarios is a focusing rail. A focusing rail, as it’s name might suggest is an adjustable rack that allows you to fine tune your focus on a subject. And as fine tuning is what you are trying to do it is worth getting a good quality rail that can be finely adjusted, some of the cheaper focusing rails have too coarse rails/racks to allow fine focusing and tend to jolt along. 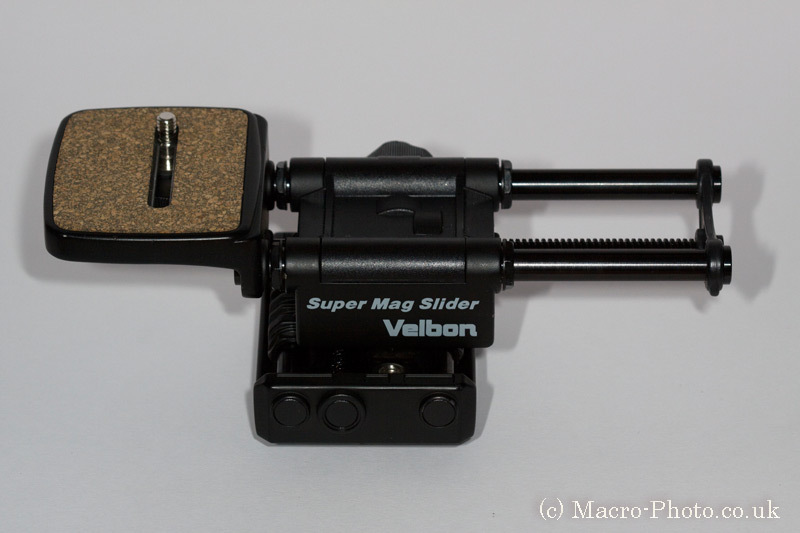 I had a cheap one originally, but due to this soon upgraded to a Velbon Super Mag Slider focusing rail, shown in the image below. In reality it was just false economics, the cheap one costing around £25 at the time, but being poorly usable (it also did not lock into position as well with my cameras and lens weight), whereas this one cost about £70, and gets me a more stable and configurable platform, and hence more acceptable shots. There’s other good rails out there, I’ve heard people recommend a Novaflex one and I know manfrotto do some for their tripod heads. What I like about the Velbon one I have is that it is not too costly, and is finely adjustable both back to front, and side to side. Whereas I don’t shoot to many insects with the rail, due to the fact that they move about a lot, there are occasions when the bug is occupied in some way, or is static for reasons due to it’s laziness or condition. This allows me to use the rail to effect high magnification shots using my MPE-65mm lens, easier than using it hand held. By having the lens steady on the tripod and rail, also means that the shot is sharper, due to lens movement of the camera and lens, particularly when the subject can be secured in position too. ← How should I get started taking Macro photos ?